The woman accused of tossing chairs and other objects off of the balcony of a downtown highrise has surrendered to police, CP24 has learned. The suspect, who has been identified as 19-year-old Toronto resident Marcella Zoia, turned herself in at around 7 a.m. after officers contacted her on Tuesday to discuss a plan for her surrender. The incident was captured on video and is believed to have occurred at a building near Harbour and York streets on Saturday morning. 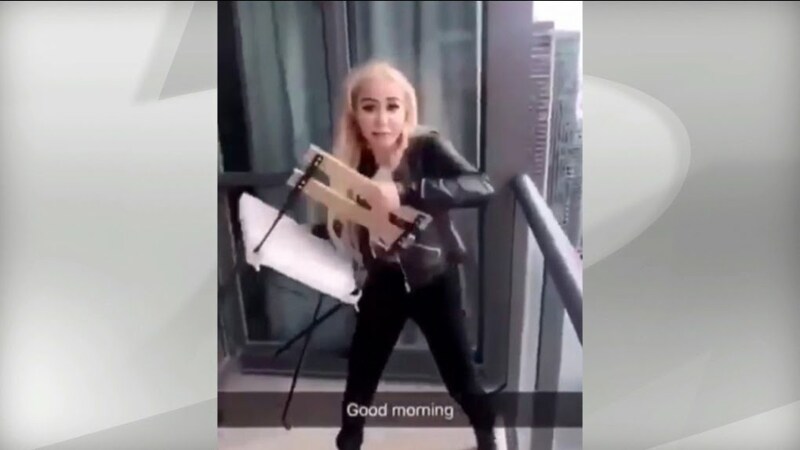 The short video, which circulated online over the weekend, show a young woman with long, blonde hair holding a chair on a condo balcony overlooking the Gardiner Expressway. The woman proceeds to chuck the chair off of the balcony, which is located on a very high floor. “I know for myself when I saw the initial video I just thought it was very callous. (She had) no regard for anybody that might be passing underneath. I can think of some pretty horrific situations,” he told CP24 on Wednesday. “People were absolutely outraged. That is likely why we got so much help from the public,” he said. CP24 has learned that Zoia will be charged with mischief— endangering life, mischief to property, and common nuisance. Police say she arrived at 52 Division this morning without a lawyer and has been cooperative with the investigation. She is expected to appear at the College Park courthouse for a bail hearing on Wednesday morning. Neighbours of the unit where the incident is believed to have taken place say it is used as a short-term rental property. In a statement released Tuesday, Airbnb said it is investigating whether any of its users were involved in the incident. If this was Fox News, she would have been labelled a Democrat by now. I hope she goes to prison for a couple of years. (2019-02-13, 10:55 AM)Stevie_Y Wrote: I hope she goes to prison for a couple of years. Life, no chance of parole. When sound found rhythm the dimensions of joy exploded. Could be a scientist doing experiments on gravity. Now ordinarily a person should be stationed on the sidewalk to keep anyone from getting hit, but what if there was and they went for a beer? Whose fault would it be then? Let's not judge this scientist too harshly until ALL the evidence is in! (2019-02-13, 11:06 AM)Lagavulin Wrote: Could be a scientist doing experiments on gravity. Are you seriously making a joke of this completely callous act? She could have killed somebody... and she did it more than once. Would you make a joke about a teenager throwing a rock off a freeway bridge? I expect better of you Lagavulin. Are we seriously trying to make sense out of a woman's actions? (2019-02-13, 10:49 AM)smokey Wrote: If this was Fox News, she would have been labelled a Democrat by now. I was right. The 6th post. Maybe she was donating furniture to the homeless under the Gardiner. Or she is an angry Leaf fan that decided to throw chairs on to the street instead of waffles on the ice. Lags didn't throw the chair nor can anyone get hurt from his ha ha ha words. I saw the video when it was floating around social media the other day. I got that oozy rollercoaster vibe just watching it. Anyway, I can see on Twitter/Facebook/Reddit that social media has already sharpened their pitchforks. I remember being a kid and like many other kids, being drawn to these types of things. I mean who didn't want to throw a rock through a window on an old building, or throw a shook up can of pop off a bridge? And honestly I would be lying if I said that I didn't think it would be kind of fun to watch a watermelon or something fall from 30 stories up. Obviously, I would never do that unless it was in some type of controlled environment where no one would get hurt. I used to throw eggs.....stupid and insensitive(never hit anyone) but never would I consider throwing soemthing so dangerous like a rock or chair or worse. This girl was probably experimenting with something, but I don't think it was gravity. Doubt she see any jail time. There were no injuries, or damage to anything (other than the chair), so it doesn't go beyond mischief/nuisance.